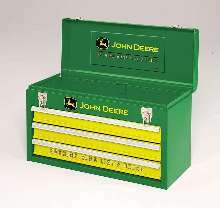 Portable Tool Chest features John Deere logo. John Deere all-steel chest measures 20.5 x 8.5 x 12.75 in. with capacity of 1,549 cu in. It features 3 full-extension drawers, comfort grip handle, and John Deere graphics, including mountable metal sign. Waterloo, Iowa, USA - April 2003 - John Deere enthusiasts can show the green and gold in a new way thanks to a special edition 3-drawer portable chest available exclusively from Waterloo(r). "We are excited to have the opportunity to honor an American agricultural icon with this special edition chest," remarked Gary Marcus, Waterloo Industries Director, Marketing and New Business Development. "The distinctive green and gold Deere colors and leaping deer logo make this box perfect for any collector." The chests measure 20.5" x 8.5" x 12.75" and have a capacity of 1,549 cubic inches. They feature all steel construction, three full-extension drawers, a comfort grip handle, and distinctive John Deere graphics, including a mountable metal sign. They come with a limited warranty from Waterloo(r). The chest is officially licensed by John Deere, with a custom graphic and color design by the storage professionals at Waterloo(r). "It's really a combination of two great midwestern companies," Marcus commented. "John Deere and Waterloo(r)." For more information about the special edition, officially licensed John Deere portable chest and other Waterloo(r) products, visit the company's web site at www.waterlooindustries.com or call customer service at 800-833-8851. Waterloo Industries, Inc., the world's largest manufacturer of quality tool storage products, is an operating unit of consumer products company Fortune Brands, Inc. (NYSE:FO).